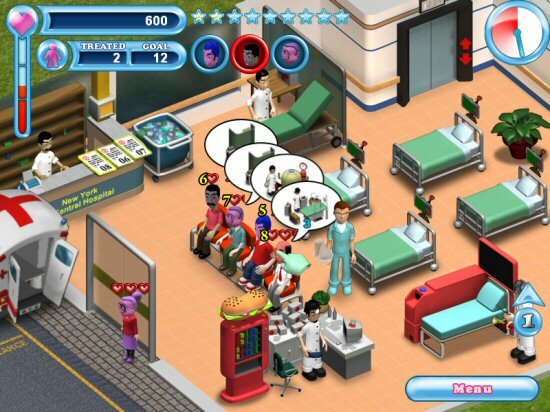 Hysteria Hospital: Emergency Ward (HH) could be described as a simplified adaptation of Theme Hospital, Bullfrog’s late-90’s, in-depth, hospital management simulation. With multi-tasking and a small degree of micro-management at the core of its gameplay, HH puts you in charge of organizing all aspects of a busy hospital ward in order to improve its reputation. In the role of a male or female nurse, it’s up to you to organize the busy wards and treat as many patients as possible, with the ultimate goal to improve your hospital’s ranking and thus move on to bigger, more challenging wards. Starting off in a small hospital ward in Maryville, you progress right through to a multi-levelled, busy hospital right in the heart of New York City. Time in HH is spent clicking and dragging patients and equipment around the wards, repairing life-saving apparatus, cleaning the wards to stave off infection and collecting prescriptions from the ever-growing line of patients that clog up the waiting room. HH is set in the U.S, where they don’t have the luxury of a National Health Service, so these patients pay for treatment. The more people you treat, the more money you earn and the more you'll have to spend on decent equipment, such as X-Ray machines, to help diagnose and cure their illnesses. With 15 different medical conditions to diagnose and treat, Hysteria Hospital: Emergency Ward relies on your ability to think on your feet while under intense pressure from the increasing demand of sick patients. Fail to do your job properly and they'll be dead patients on your conscience.